Pre-Columbus America is often described as "prehistoric" - because historians rely on written records, and, for the most part, such records were not generated by Indians / people who lived in the Western hemisphere. There are notable exceptions: the Maya, the Aztecs, and, perhaps, the Inka, though their khipus have not yet been decoded. However, these cultures cover only small regions and brief glimpses into time. As such, the story of human life in the Americas before the conquest is largely unknown. And where something is unknown, some people will see "mystery", or worse, a blank canvas to project their own theories and biases onto... unsurprisingly, many did. 1491 tries to give a reasonably balanced account of what is known, what is theorised (by credible experts), and what is contentious and why. The book ignores the quacks, fraudsters and fantasists, but even the experts evidently have frequently been wrong in the past. Academics in the humanities and social sciences seem to spend half their professional lives forming loose tribes and having spats with each other. Fortunately, the reader gets only the rough brush strokes picture of the essence of those spats and is spared the petty detail. The danger of a book that tries to cover a topic where much is still under contention is that it might end up on "the wrong side of history" - not the evil side, but simply the side that comes to incorrect conclusions. 1491 spends a lot of pages describing how knowledge and theories evolved. Often, there seemed to be a consensus in the past, only for it to be overturned by later theories. Outliers sometimes gathered momentum, became mainstream, replaced an old consensus with a new one. 1491 presents current knowledge, current consensus, current thinking. 20 years from now, more will be known. 100 years from now, perhaps many of the current consensus theories will have been replaced by others. As such, 1491 is a book that probably has an inbuilt "Best Before Date". Then again, what human theory does not? The author is not without bias - he makes it clear which theories and perspectives he finds more convincing. However, he does not shy away from presenting the counter-arguments. The result is a text that is surprisingly readable and frequently surprising. Surprising, because its central thesis - and the current thinking of many archaeologists, historians, researchers and scientists - paints a picture of human life in America that is very different from the picture the general public have been taught (in school or by pop culture). It's a non-fiction book, but even so, SPOILER ALERT, I'm going to talk about the big picture, something which the entire book slowly creates. The central thesis is that both American continents were quite densely populated by a plethora of human cultures. Much of the landscape was managed and shaped by humans, both in North America and South America, including the Amazon region. Indian farming took many forms - sometimes, intense farming of a style not alien to Europeans. Terraced farms, irrigated fields, fertilised soils, domesticated crops. However, many Indian cultures used other methods - methods which were not recognised by explorers or settlers or academics for centuries. In particular, they used fire to control the landscape, they planted desirable trees (which provided food or other useful resources) and removed less useful ones, and they adjusted the environment to suit their needs. In North America, this created a landscape alternating between fruit and nut bearing trees, fields, and grasslands, like an enormous park landscape. Indians were not just hunter gatherers, but responsible for consciously creating an environment rich in resources they could gather, with ample habitat for animals they preferred to hunt. Then came Columbus. On his third voyage, his crew was sick, beset with a plethora of diseases. When they met Indians, they passed on infections. Even as Columbus returned to Europe, the diseases went like a wild fire through the human population of the continents. Because Indians had not domesticated many animals (only dogs, llamas, alpacas, guinea pigs and muscovy ducks), they had not lived in close enough proximity to catch many diseases from their beasts. Europeans, Asians and Africans, on the other hand, had. Measles, smallpox, flu, and others had made the jump from cows, horses, pigs and birds to humans. When those diseases reached the Americas, the population there had never encountered them before. Worse, for reasons that are not fully understood yet, Indians' immune systems were less able to cope with viruses and bacteria, so the infections did not just catch the immune systems by surprise, but they wreaked more havoc in every person they infected. Within a few years, Indians were decimated by disease. Over the course of the next hundred years, between 90-95% of Indians died because of European diseases. It was a holocaust of unprecedented, and never-yet-repeated scope and tragedy. So, when the first settlers and conquistadors arrived, they unwittingly arrived in the middle of an apocalypse (the conquistadors), or in a postapocalyptic continent (North American settlers). They arrived in a place where 30% or 50% of people had just died, and where more were continuing to die. They arrived in societies that were collapsing, or that had collapsed. The conquistadors managed to destroy two empires (Aztec and Inka) because those empires had just lost huge chunks of their armies and their leaders, and because the ensuing chaos and power vacuum destroyed their ability to defend themselves effectively against ruthless invaders. Even with all that chaos, the conquistadors had help from Indians who wanted to see those empires fall, and who wanted to use the conquistadors as a tool to bring about this change. Without having Indian allies, the conquests would probably have failed. Without the epidemics that preceded them, they would definitely have failed. After the conquest, a huge myth slowly evolved: the myth of the Indians who lived, passively, in a Garden Eden, picking fruit, hunting, gathering, and not creating anything worthwhile. Or the myth of the noble savage, attuned to nature, living as human animal in The Wild. The myth of America as pristeen, pure, natural continent, until Europeans came to be enterprising and make good use of it / ravage it (depending on your political leanings). It's a myth that arose because most Europeans only ever saw the postapocalyptic continent, where forests were growing, human habitat was slowly being reclaimed by plants and animals that had been managed and kept in check for millennia, but which were now free to take up the suddenly vacant space. It's not mentioned in the book, but recently, climate scientists have theorised that the so-called Little Ice Age / Medieval global cooling event was partially the result of the CO2 captured by forests that grew on previously cultivated land after Indian populations had collapsed. 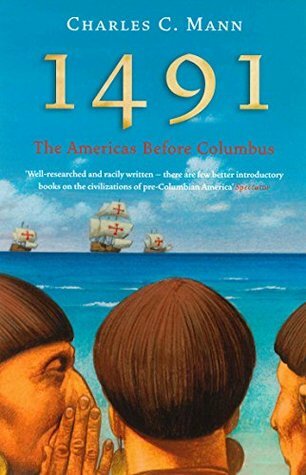 1491 is an excellent book, well worth reading. It gives a sense of what was lost in terms of human heritage (even if no book could ever capture the scope of human tragedy involved). It suggests glimpses of what human heritage gained from Indians - not just fruit and vegetables and a healthier, more varied, tastier diet, but a more democratic, anti-authoritarian spirit, and a more free way of life.It's a fascinating read, and well worth your time.